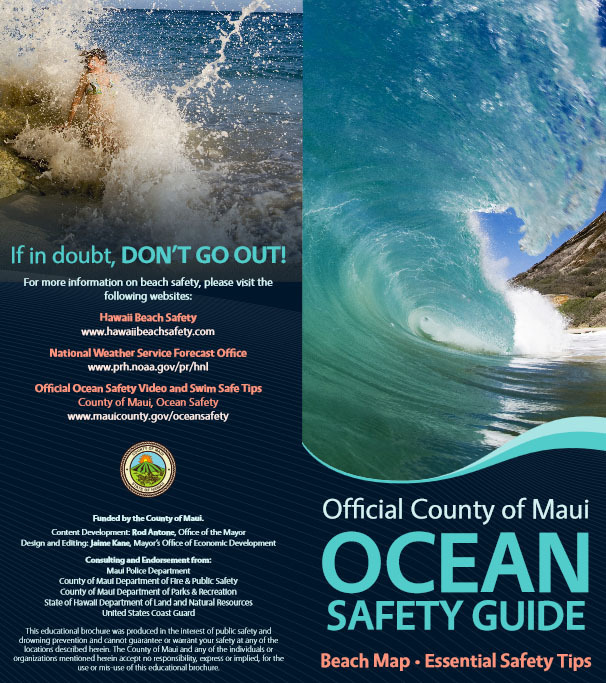 Several months after the debut of an educational ocean safety video at Kahului Airport, Maui County officials today announced the release of an Ocean Safety Guide brochure available for download online. The brochure includes a map of County beach parks that have lifeguards, as well as tips on how to deal with rip currents and shorebreaks, and how to avoid chance encounters with sharks. The brochure was created under a collaborative effort with County, State and Federal officials. 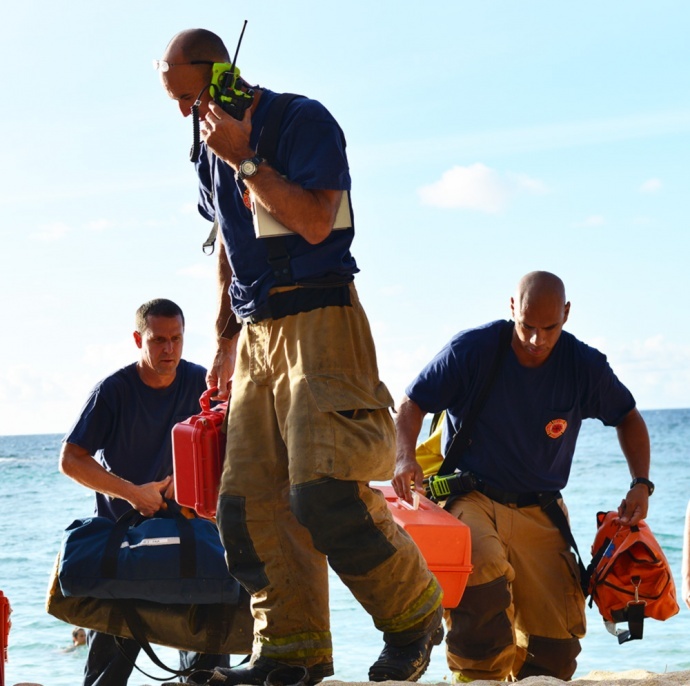 The Maui County Department of Parks and Recreation’s Ocean Safety Division, the Department of Fire and Public Safety and the Maui Police Department partnered with the State Department of Land and Natural Resources and the US Coast Guard to develop the content for the Ocean Safety Guide. Maui County also encourages schools, service groups, non-profits and other organizations to distribute the safety guide for educational purposes. County officials say that although the current brochure includes a map of the island of Maui, the County is also working to develop Molokaʻi and Lānaʻi specific brochure templates as well. Below is a breakdown of drowning incidents in Hawaiian waters as referenced in the “Visitor Safety: How are we doing?” report compiled by Dan Galanis with the Injury Prevention and Control section at the state Department of Health. 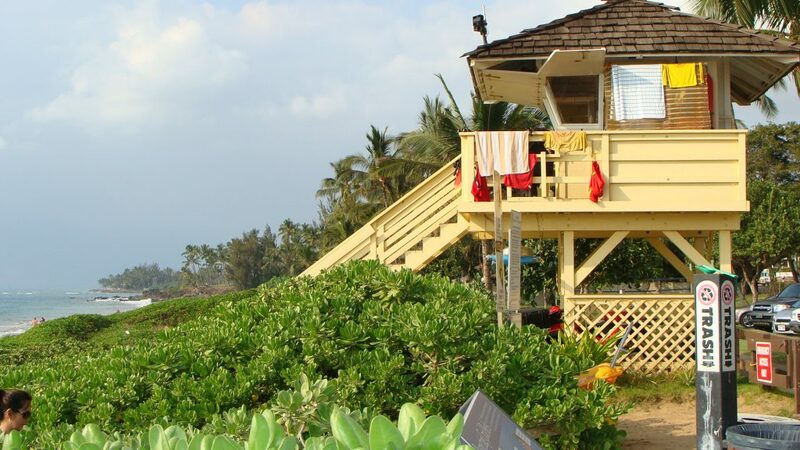 According to the report, there were 16 spinal cord injuries at Mākena between 2009 and 2012; 5 at Kāʻanapali; 3 at Hāmoa; and 3 at Polo Beach. 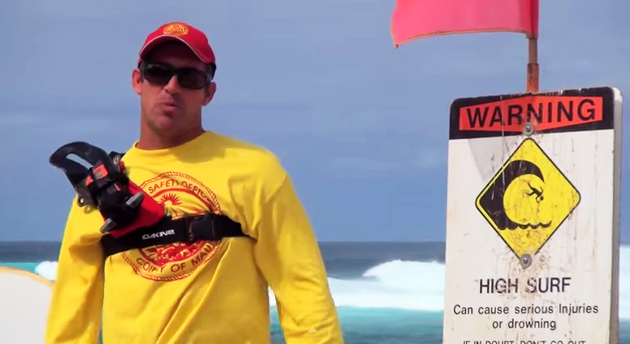 The leading cause of spinal cord injuries in Hawaiʻi between 2009 and 2012 was ocean activities, with 151 ocean-related incidents reported across the state including: 42 from body surfing; 37 from body boarding; and 42 that were tossed by a wave. Most of these, 77% involved non-residents. 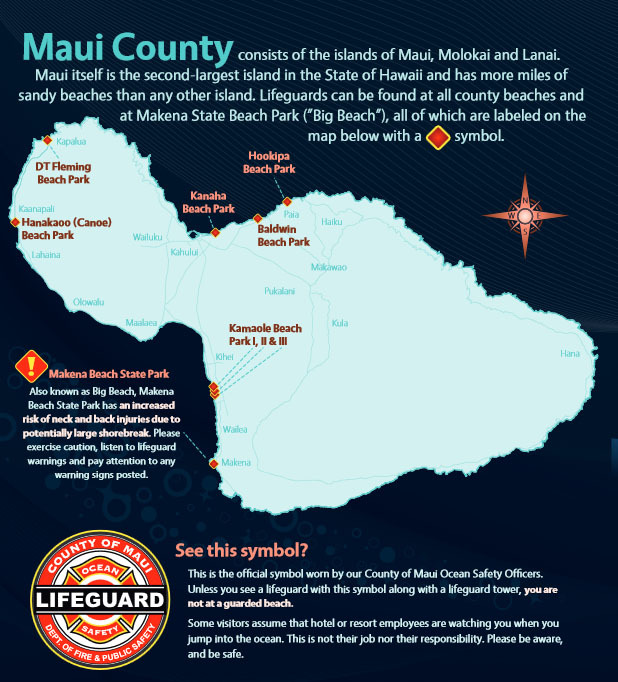 • There were a total of 150 ocean drownings in Maui County over the 10 year period between 2003 and 2013, which translates to 6 to 19 per year (including 95 on Maui, 8 on Molokaʻi and 2 on Lānaʻi). • Most of these, 72% were non-residents. • 34% involved swimming; 29% involved snorkeling; and 13% were from unintentional immersions. • Number of drownings per activity: 36 swimming; 30 snorkeling; 14 unintentional immersion; 10 diving; 8 unknown; 7 other activity. • Over the 10 year period between 2003 and 2013, there were 21 drownings in Kāʻanapali alone, 13 of them in the Puʻu Kekaʻa or “Black Rock” area. 20 of these incidents involved visitors. The brochure includes a map of County beach parks that have lifeguards, as well as tips on how to deal with rip currents and shorebreaks, and how to avoid chance encounters with sharks. Brochure: Section on Rip Currents. 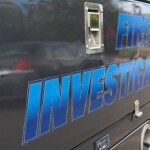 Fires at Haleakalā Highway Junction Labeled "Suspicious"